This is the type of thing you're looking for when you make your inventory of electrical needs and wants. Welcome to your new home! There is nothing quite like the hope and excitement of new home ownership, whether your purchase is an older home, or in a new housing development. One of the first things you'll want to do is make an inventory list of electrical issues and problems to bring to the attention of your electrician. If you didn’t have a home inspection, or if you didn’t read your home inspection report, do it yourself insofar as you can. It's much easier to see problems before they’re hidden by your sofa or buffet. Plus, it’s more convenient to have an electrician take care of your electrical needs before you move in. For this article, we’re going to assume you’re purchasing a previously-owned home since this is most often the case. We are also going to believe you have had a home inspection by a professional or are planning to have an electrician perform one after you make your checklist. Before you start, consider your family and their needs and desires. Now is the perfect time to add lights, an electrical outlet in the master bedroom, heated flooring in the master bath or move the wiring to a convenient location for the internet hub if it’s in an undesirable place.Here are some of the things you'll want to look for. Keep your eyes open for things which may not be included in this list. 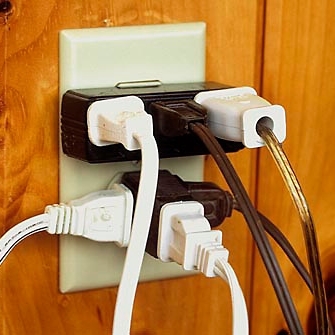 If you can see this happening in your near future, have outlets added before you move in your new home. Check the light and dimmer switches. If any of them are hot, it means electricity has built up in the switch; shut it off and call an electrician immediately. Note: a dimmer switch will be warmer if you have it to the darker setting, however, it should never be hot or smoke. Also, the old dimmer switches don't play nice with LED lights, so if you plan on using those and want to be able to dim them, you'll need the LED-compatible dimmer switch. Examine the outlets in each room of the house. You’re checking to see that all the receptacles are three-prong, that all outlets and switches have a switch plate covers and that they are in a convenient position in relation to where you want your furniture. They shouldn't wobble or move when you plug something in, either. If you need new outlets, consider upgrading some of them to include USB ports. You can find them here. Sometimes homeowners buy decorative switchplate or outlet covers, and then remove and take them when they move, which means you need to replace them. You should do this right away for two reasons: first, it keeps moisture from getting into the wires. Second, it keeps you or your family members from getting an electrical shock. The next thing you want to check for is fans and light fixtures. First, make sure that the ceiling-mounted fixtures are secure, and then check the wattage and bulbs. It’s possible that the former owners put a higher wattage bulb in their light fixtures than they were safely designed to handle. (Realtor’s trick: brightly lit homes sell faster.) It only takes a few minutes to make sure this is not the case. Do you like the fixtures? What about ceiling fans? Under counter lighting in the kitchen is always a great value. Check the range hood fan and lights, the garbage disposal, the built-in microwave oven to be confident they’re working. The outlets within six feet of the sink must be GFCI outlets. In our next blog, we'll continue our new home electrical inspection by highlighting safety issues and an outdoor electrical inspection.